For a really long post, but it's worth it, I think. I started designing flowers for my wedding. They were really ugly first attempts but I persisted creating several credible blossoms. One of the flowers most used in wedding bouquets are roses, but they are also difficult to create. Mary Konior has a design called Rosa Frivola which is essentially a length of scalloped edging rolled into a coil that only looks as good as the way you coil it. I haven't tatted it, but I wonder how well it will hold it's shape and my suspicion is that it won't. 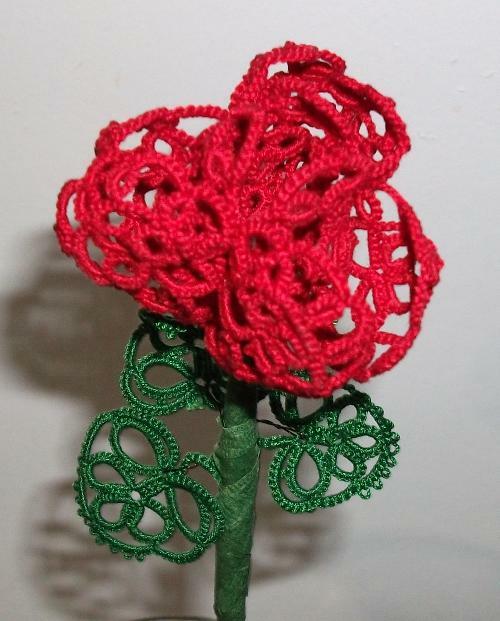 Roses get their shape from layered petals and to repeat that in tatting means tatting lots of individual petals. Typically roses used in bouquets are buds and not full blown roses. Years ago I made an attempt at many layers but I ended up with a lump of tatting that didn't have any real shape so I tatted a cup shape to enclose it. Lots and lots of tatting and when I was done, it was just a lumpy mess like this and I might have persisted with it, but who wants to invest hours and hours to tat one single flower? The trick is how to get something roughly rose shaped with a suggestion of layered petals without having to tat and tat and tat, while at the same time making the petals have some kind of shape. I considered one possibility would be to start with a small styrofoam ball, cover it in a base of tatting and add petals around the outside. The ball would give it the bud shape and structure and then the tatted petals wouldn't have to do anything more than attach to the ball base. 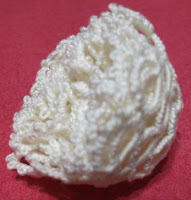 I discarded the idea because the styrofoam ball would show through the lace which would necessitate figuring out a simple way of making the ball the same colour as the thread. Over the years I've made several attempts, but they just didn't work for me. One of the other flowers I wanted to create was a blue florist iris. Not the big flashy bearded iris, but the simple skinny florist iris, not only because I like them, but also because it's one of the few flowers that is blue. The trouble is that those skinny little flat petals are hard to hold in shape. Then I looked at some of the irises used in bouquets and I realized that they were mostly buds that haven't opened out flat and it gave me and idea. It looks like the idea worked and maybe I can extend the idea to create a more open iris. 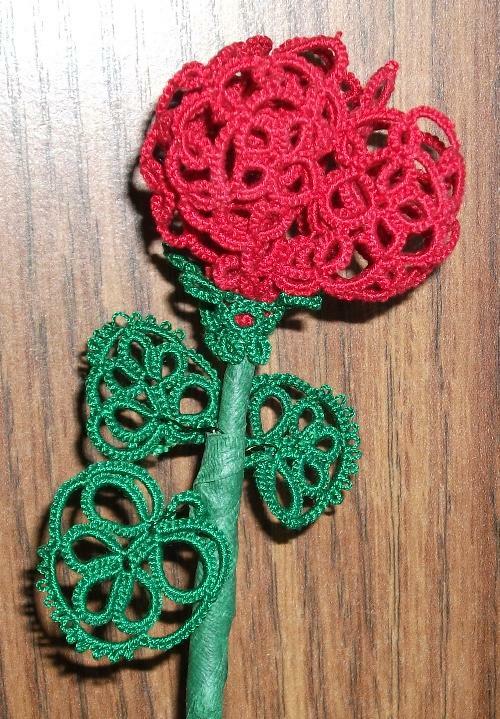 In the interim, working on the iris gave me and idea for tatting a rose and I think I might have got it. It isn't quite what I want, but it does have dimension and shape and individual petals that give the suggestion of a rose. 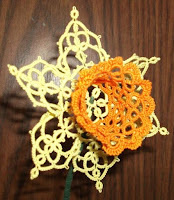 It doesn't require oodles of tatting, although it does take a fair amount of work. from the base of the sepal to the top of the petals it's roughly 2 inches in size 20 thread, and about 2 inches wide. 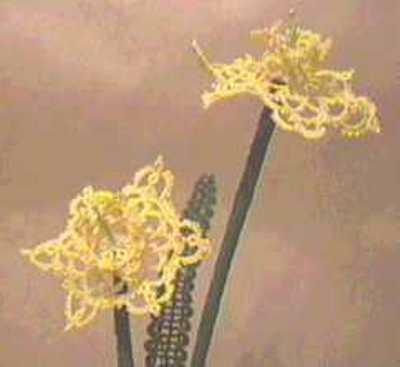 The petals can be wrapped around one another or the tips can be curled out just like a real petal. It isn't perfect, but it's the closest I've come. Want to see? This design works only because the chains are tatted tightly. Let me repeat, tat the chains tightly, it's the only thing that gives the design shape. Usually you don't want your tatting to curl, but in this instance that's exactly what you want. 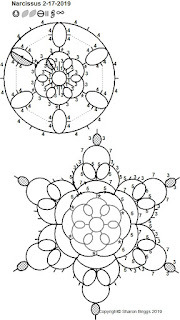 The flower is worked in 2 layers, both of which are joined to the same starting ring. The starting ring has 6 picots and the inner layer is joined to picots 1, 3 and 5, while the outer layer is joined to picots 2, 4 and 6. The inner layer is done in 3 segments so you begin tatting up one side of the first segment and then down the second side, joining back into the first picot of the starting ring. Cut the thread leaving 5 or 6 inches, tie and knot and insert the thread ends through the starting ring. Skip over to the 3rd picot and start again working up the first side of the segment joining to the appropriate chain of the first segment. You'll see insanely long picots in the diagram with tiny red star markers on them. DON'T TAT THEM THAT LONG! 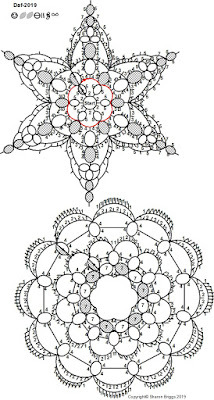 They are normal size picots, but the drawing is flattened out resulting in those enormous lines. 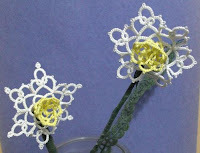 It's one of the things that happens when you show 3D tatting in 2 dimensions. Tat the second section leaving long ends, tie and insert through the starting ring. Tat the 3rd section joining the chains to the other 2 sections. You'll end up with an odd sort of tube shape. 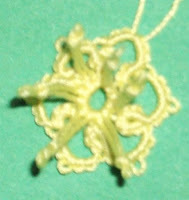 For the second row, tat the chain up the side of the petal joining into the base of the tiny ring. Tat the next chain joining to the base of the small ring, and follow the diagram up the side of the petal. At the top of the petal tat one small ring joining it to the base of the large ring on the first row. Then make a join at the star on the first layer at the top of the petal followed by another small ring joined to the base of the second large ring. Tat down the second side of the petal. Cut the thread leaving 5 or 6 inches and tie the ends poking them down through the starting ring. Repeat for the other 2 petals. You'll note that the petals formed by the second layer are joined to the first layer once at the bottom at the beginning where the tiny ring is and once at the top near the end of the petal between the two small rings at the top. Now all that's left is to tat the sepal. You can begin with the starting ring of the sepal and enclose all of the thread ends in the ring before you close it, or pull the thread ends down through the sepal after it's tatted. 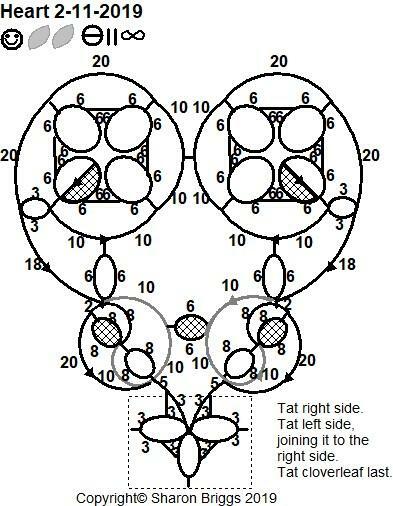 Tat the split ring to climb out of the staring ring and continue tatting ring and chain ending with a split chain. Start the next row with a split ring. The inward facing rings are joined side to side, but the larger outward facing rings are not. Cut the threads 5 or 6 inches long, tie and feed down through the sepal. 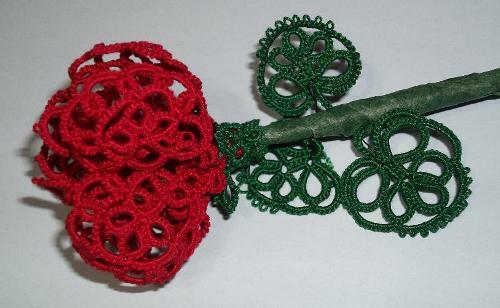 Insert one end through the starting ring of the rose and knot the ends. This will tie the sepal and the rose together. Pull all of the thread ends of the rose down through the sepal and pull up on the outer rings of the sepal pushing the bottom of the rose firmly inside the sepal. Take an eighth inch dowel and file down one end. Push it up through the centre of the starting ring of the sepal, it's going to be tight, and if you can, through the starting ring of the rose. Wrap dowel and thread ends with florist tape. The thread ends are what hold it onto the dowel. You can omit the leaves if you choose, or tat them, ending with a chain or just threads and wrap the chains or threads with florist tape joining it to the stem of the flower. So here it is at long last. The diagram is necessarily huge, so if you have trouble viewing it, please let me know. This design nearly drove me daffy. If I haven't mentioned it before, I have rather strict guidelines for flowers. They need to be relatively life size and life-like. They need to hold their shape without the use of wire. I figure that if you want a tatted flower you want it for display and you don't want it to flop over like a wet noodle. 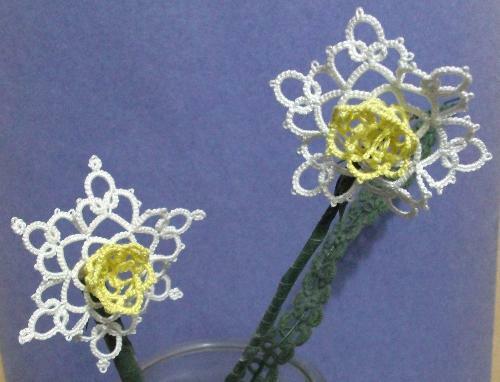 I also figure that if you're going to invest that much time in tatting it, that you want it to last for a lot of years and wire, even coated wire can leave rust spots. The flowers I designed for the Transitions in Tatting book have been sitting in vase for years and they're still holding up 20 years later. I vacuum the dust off regularly and I did wash and fluff them once about 5 years ago but without wire, starch or glue they're still looking like flowers. Those requirements add a few more constraints to your designing. Having designed a daffodil before, I knew what I needed and just had to execute it. After referring to various pictures I wanted the trumpet section to have a slight flare and finish with a ruffled edge. Everything I tried was too tall too short, too wide, too loose, too ugly and in short, it took multiple tries to get a finished result I could live with. 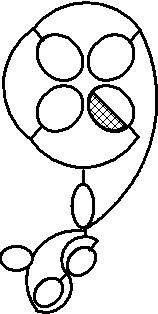 Then I started drawing it and if the tatting made me want to throw shuttles, the drawing made me want o throw the computer. It's not the computer's fault, more like I was just tired and frustrated with the design already. 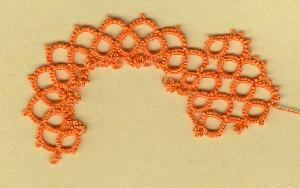 You never realize how hard it is to explain the construction of 3D lace until you try it. In simple terms the flower is a flat back with a tube stuck in the middle of it. 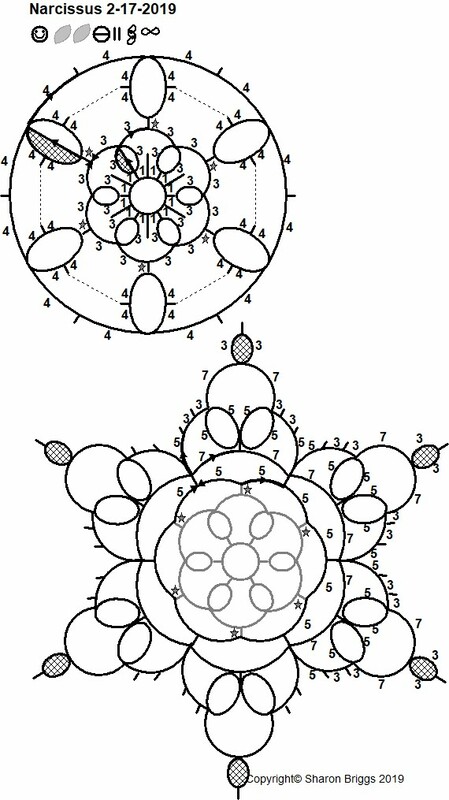 Trying to show a tube shape in a flat drawing is a bit of a problem, so what I've done is to draw it as if it were stretched out so you'll see what appears to be insanely long picots between rings. 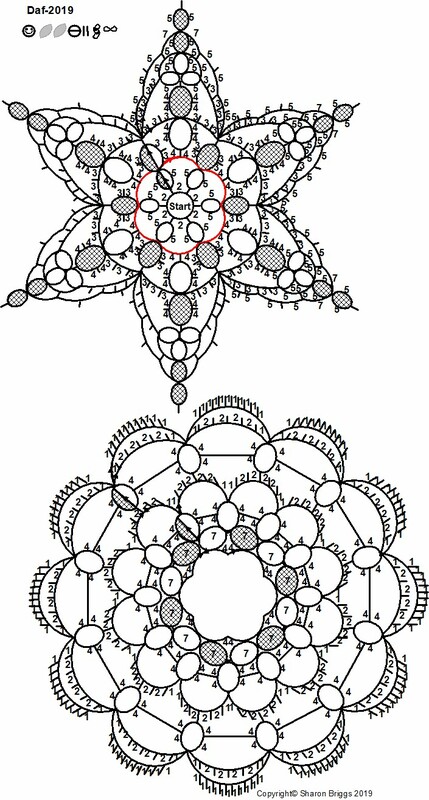 I initially used normal picots with a dotted line between them, but that seemed more confusing because it might have been interpreted as picots that weren't joined. I also considered breaking the design down row by row, but that would have made for an enormous drawing, so for now it's just 2 drawings, the back and the trumpet. The yellow petals will overlap a little bit, just like in a normal flower. The chain that is drawn in red on the base is where the trumpet attaches to the base. There is a chain in yellow tatted for the base. When beginning the trumpet tat the same chain in orange joined to the same points as the underlying yellow chain. 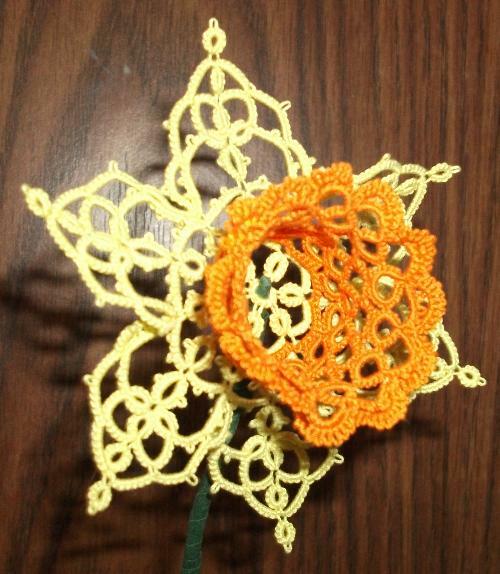 There is a picot in the middle of the yellow chain but at the same point in the orange chain there is a left and right ring pair 7-7, with each pair joined to the pair beside them. Clear as mud, right? Anyway, here's the pattern. If anyone tries it out and has a problem, let me know and I'll see if I can't make things clearer. I forgot to mention, this flower is about 4 inches stretched point to point and the trumpet is about 1.25 inches tall. I had an idea and set about putting it into lace. Part way through, what was supposed to be a petal was conforming more to the shape of a hexagon, so I cut it back and started again only to discover that the only way to accomplish what I wanted was to have outward facing rings on each petal point which I hadn't done. Sooooo, I unwound the bobbin and pulled back all of the rings and chains on the previous row and then re-tatted it with the outward facing rings now in place. Then I started on the next section and the ring size I had chose was too big. I unwound the bobbin and pulled the thread back to the beginning. I have no problem with undoing 3, 4 or 5 rings and chains one stitch at a time, but 12 or so is just too many so I unwind the bobbin and pull the thread back. By the way, I noticed in one of the earlier comments someone mentioning that they tat tighter than I do. 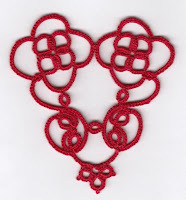 When I began tatting, I had such a stranglehold on the thread my stitches were so tight, I couldn't have wiggled a hook between stitches and I had to use a needle, frequently breaking the thread. One of the first things I tatted was a hanky edging in size 80 thread. 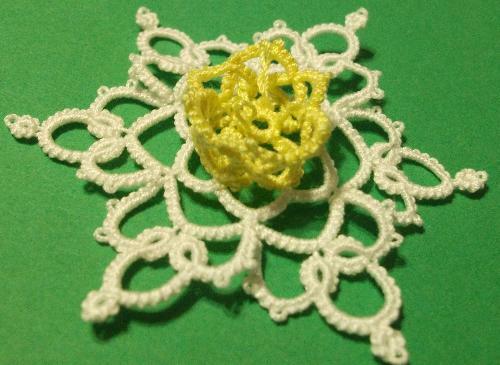 Once I completed the edging I laid aside tatting and picked up another hobby, but I was plagued by the loss of feeling in the fingertips of my left hand. I had a series of tests done to find out why my fingers were numb, although by the time the tests were scheduled the feeling had begun to return, and I took my shuttles along to the hospital to fill in the hours between tests. Funny thing, as soon as I started tatting my fingers went numb again. The prognosis was that I had desensitized my fingers. Well duh, I kind of figured that out for myself! 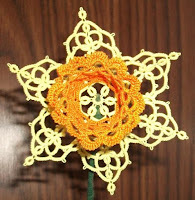 Consequently, I had to make a conscious effort to tat looser, or give up tatting altogether. Back to my current project, I have just finished this round of 24 rings and chains and they all have to come out. AGAIN! I have a limited amount of this thread colour, so I can either take a chance that I'll have enough to complete the project and cut it off, or save the thread and undo another 24 rings and chains. I'm tired of pulling this thing apart and sewing in ends from all of the starts and stops. I think maybe it's time to go read a good book and leave this disaster until morning. I thought that since I was in the mood for spring, that I'd continue in the daffodil family and tat a paperwhite. Paperwhites are little and they grow in clusters. To get the right shape I thought that I'd tat up one side of a petal and down the next using graduated ring sizes to get the wider middle section. 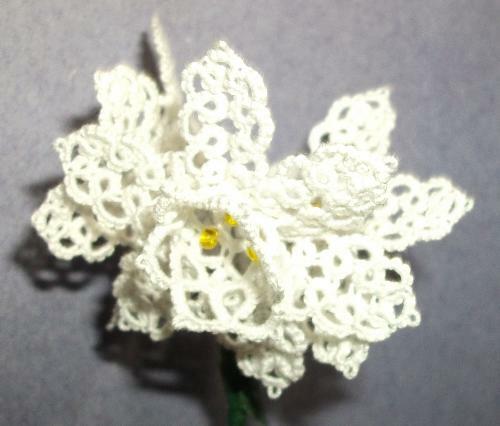 The trumpet shape on a paperwhite isn't very pronounced so I decided that beads would give enough of a suggestion of stamens and a single row of tatting would do for the trumpet shape. 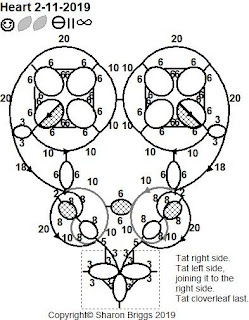 The central ring is tatted with 3 beads on alternate picots of the centre, beginning with a bead on the first picot leaving the last one as a mock picot. The first row has short chains with a picot in the middle. You'll note tiny stars on this picot in the diagram as row 2 and the trumpet shape both join into this picot. The rings forming the petals are tiny with lots of joins. The rings at the tips are 3-1-2 or 2-1-3, with the longer side (3) to the outer edge of the petal, and the other side joined to the ring beside it. Over 10 joins on each petal for 6 petals, made for jabbing the hook through the picot and against my finger over and over again nearly 100 times for each flower and since they grow in clusters I did 3 of them in a 24 hour period, finally wearing a hole into the side of my finger -owie. The flower is about 1.75 inches across done in size 30 thread. I think it might work in size 20 thread if one ring and chain repeat was omitted from the middle of each petal, but I'm not going to try it as my finger is presently out of commission. 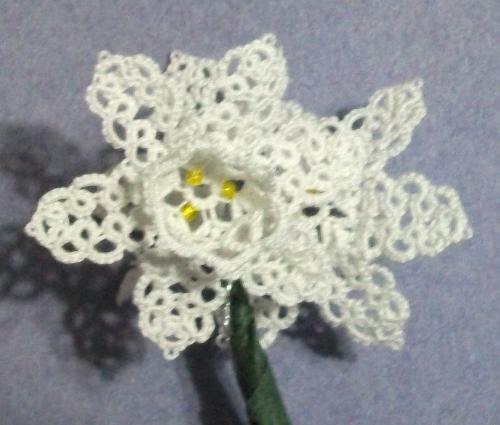 Size 40 thread would make a slightly smaller flower, but it still roughly the right size for a paperwhite. 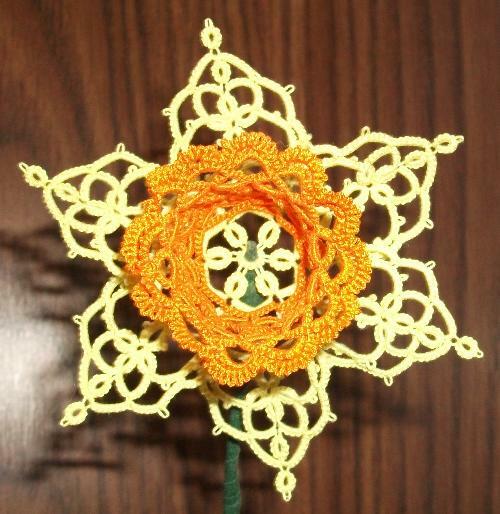 The pattern for this little gem is really very easy without any split rings or split chains or really anything special but it does make a cute little flower. There are a lot of stitch counts in a very small space, so let me know if the pattern isn't readable and I'll get it reposted in a larger format. 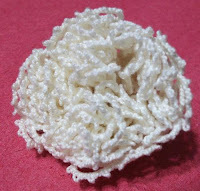 You know all those twisty turny tangles we try so hard to keep out of our tatting? Well I've just spent a ridiculous amount of time trying to get them in. Aaannnddd once I got them in they didn't stay in. So I opted for teeny tiny knots. Would you believe it took almost as much time to tie these idiot knots as it did to tat all of the yellow bit? No, you wouldn't. Well you ought to. And why would you want to tie itty bitty knots? To make stamens of course. I'm tired of cold and snow so I was thinking spring. Does this say spring to you? It does to me. 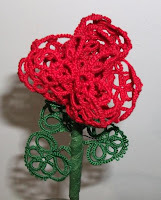 3D tatting can be challenging, but you just have to take it one step at a time. Beginning with these frustrating knots I started with a central ring in yellow of 2-2-2-2-2-2, but that left things empty in the middle. 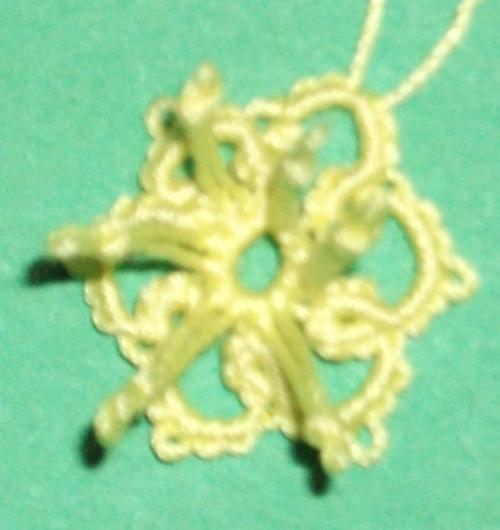 Then I tried alternate small picots and large picots with a stitch count of 1 between. Bend those ridiculous stamens out of the way tat the split ring and carry on joining into the small picots. Stretched out I allowed about 1.5 inches for the long picots. Just enough so that I could tie a knot in the tip of the picot. You want to keep all the long picots about the same size. See what the first round looks like - alien antennae. Take note of the little stars shown on the first row. More about them later. The large rings on row 2 are 4-4-4-4 and I made the side picots a little bit longer than usual so that the trumpet part of the flower would have a bit more flare. You'll notice that although the pattern shows this row as being outside the first row, the tatting is actually perpendicular to it. At this point you may want to pull on the tatting and stretch it into shape. It should kind of look like a thimble. Here it is completed. Change to white thread and join to row 1 of the yellow trumpet where marked with stars. You'll actually be joining to the picots on the bit with the antennae. There's already a row 2 of the yellow trumpet in these joins at the tip of the picot, so you have to make the white join into the picot beside the yellow. You can join to the left or the right of the yellow join, but be consistent. Once you have the first row of white done you can start to see the flower taking shape. Blocking 3D objects can be problematic which is why I don't usually bother with blocking it. I pull the lace into shape tugging and stretching the lace. On this design, you could block the white part of the lace, but on the yellow part you'll have to be content with finger blocking. Finish it off by grasping all of those tiny knots and pulling them up to sit neat and pretty in the middle of the flower. 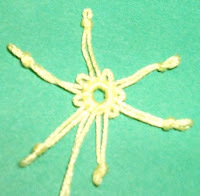 The finished flower is about 2.5 inches from point to point done in size 20 thread. These samples were done in Lizbeth Lemon Yellow and White. top all you'd get on the visual is a straight line. Showing it flattened out makes for those longer lines. You'll note that on the rest of the diagram row 2 is omitted because you join into row 1 and continue on from there. I probably should have taken a picture after the first row of white was done, but I didn't think of it. I tatted the first one using twisted picots and tiny outward facing rings on each petal. 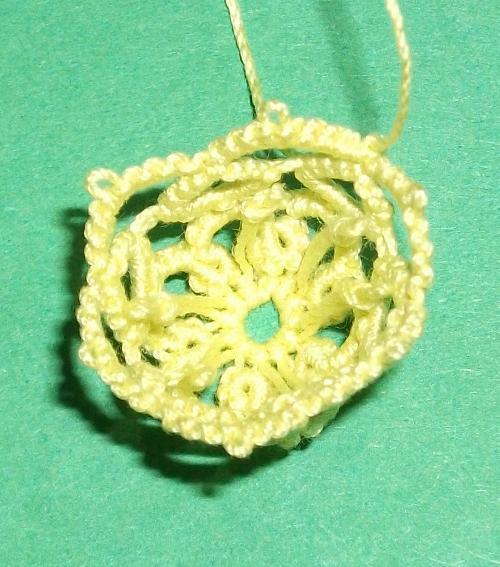 I did the second one with teeny tiny knots on the stamens and omitted the outer ring on each petal. I think I prefer it with the outer rings and that's the way it's drawn, but you can use them or omit them, whichever way you like it. For those of you thinking I'd go for a spate of tatted eggs, sorry to disappoint, I'm more in the mood for flowers. 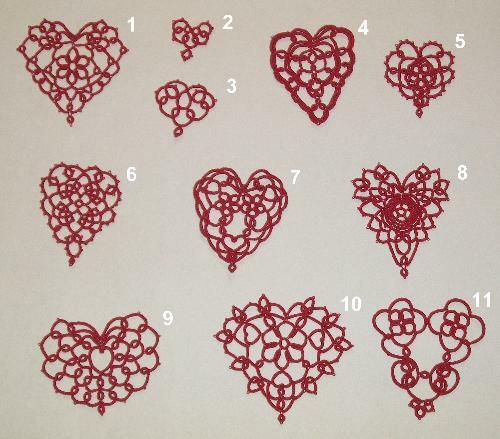 Here's a listing of the hearts and the pages with the patterns. They're listed in the order that they were designed and the list below links to the pattern for each heart. I have to say it's not my best work, but with Valentine's Day looming tatters are always looking for new heart designs and I'm sure you'll find one or two you like and you still have enough time to tat one or two before Valentine's Day. I've also labelled this page Feb 2019 Hearts so that it will always be easy to find. I'm not thrilled with the results, but there it is. I swapped shuttles to change the curve of the chain and I think I have correctly shaded the rings to show which shuttle they are tatted with, but trying to remember what was done working upside down and backwards, I might have goofed. Not that I think anyone's going to want to tat this one, but I've been wrong before 😄 So here's the pattern anyway. "Google+ Comments: Support for Google+ comments will be turned down, and all blogs using Google+ comments will be reverted back to using Blogger comments. Unfortunately, comments posted as Google+ comments cannot be migrated to Blogger and will no longer appear on your blog." I think I pretty much have the hearts worked out of my system, but for convenience I'll do a listing like I did for the snowflakes as it makes it much easier to find the pattern you're looking for. I thought I'd start with a 4 ring motif and drew out what looked like a decent first half of a heart pattern and began to tat it. The first side went great, then I started working back up the second side. See the problem? No? Well follow the yellow brick road and look at what happens when you tat it in reverse. There's another cloverleaf (not shown) on the bottom but then when you try to work it up the second side you join into the previous join...Wait a minute, there is no previous join because that part doesn't exist yet. OK. just slip in a paperclip or safety pin or scrap of thread as a marker and continue tatting...Oops, there's another one, and another. Rats, they're all over the place. The only sane way to do this design is in 2 pieces. Right side, left side and finish with the cloverleaf on the bottom. Phooey!!! And it was going so well up until then. That's the second drawing I've done that looked good on paper, but was a stinker to execute. On another note - did you see what Muskaan did with the January 31st heart and flower design? First she did the dimpled ring and the little bottom ring in one colour and the rest of the heart in a second colour. Then she did the dimpled ring in red, the flowers in yellow surrounded in green with an outline in a creamy beige. Outstanding! I may be able to design patterns, but I doubt that I'll ever have her flair for colour.